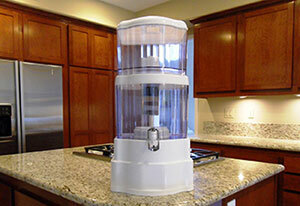 Low initial cost and fast set up are two benefits of countertop water filters. Activated-carbon filter material, results in better tasting and healthier water. 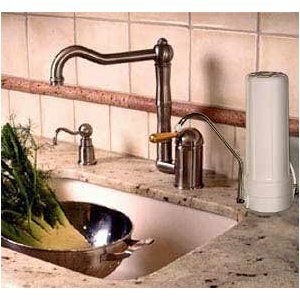 The top rated countertop water filters remove sediment, chlorine, foul odors and tastes, and some heavy metals. These filter greatly improve the taste of tap water. In this section, Countertop Water Filters are any type of water filter that is sits on, or is mounted above the kitchen counter top. These can be gravity-fed, pitcher-style water filters, or they can be connected to, or mounted directly to your kitchen faucet spout. For ease of use and short-term effectiveness, countertop filters cannot be beat. However, not all the filters can equally remove contaminants like chlorine from the incoming water. The best filters will also remove chloramines, while others cannot. Although countertop water purifiers are quicker to set up and are generally less expensive than under counter filters, they do take up counter space. The initial lower cost of some less capable units is usually offset by higher long-term costs. Replacement filters on these cheaper units do not usually last very long, typically 40 gallons or less. Replacement filters tend to run from $20. to $35., so on a cost per gallon basis, they have a much higher long-term cost than other filters. Although the cost differs depending on the model and brand, most Countertop water filters are relatively inexpensive. Most models cost just a fraction of other filter systems. Most countertop water filters offer good results for the money, however, as with anything else, you generally get what you pay for. More expensive models are usually better at removing heavy metals, pesticides and pharmaceuticals, than cheaper models. If you know what contaminants are in your water before you purchase a filter, you’d be better at selecting the right filter that’ll remove the pollutants you want removed. We’ll go over your options of testing your water, and will review each filters ability to remove specific contaminants. Small filter cartridges will become fouled quicker than larger filters. Because of this, the life of the filter will be shorter than models with physically larger filters. The filter life of most top-quality countertop filters is about 500 gallons. Around that time, the old filter needs to be replaced with a new one. A family of four can easily use 4 to 6 gallons of drinking-quality per day, considering the uses of drinking water. A typical family will make at least one pot of coffee per day. They’ll use it for drinking and for other mixed drinks. Filtered water should be used for making soups and for other cooking. Families will also use clean filtered water for their loved pets as well. At this rate, a filter with a 500 gallon capacity would need replacing about every 3 months. The typical cost for a premium replacement filter is about $45. This is still much cheaper and more convenient than having to buy bottled water. 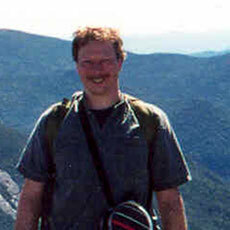 As with any product type, better, more-capable models are available and cheaper, less capable models are available. In addition to the main benefit of great-tasting, healthier water for you and your family, fast, easy set-up and low initial cost are the two other major benefits you’ll realize. 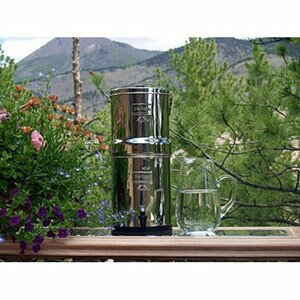 There are different kinds of countertop water filters. 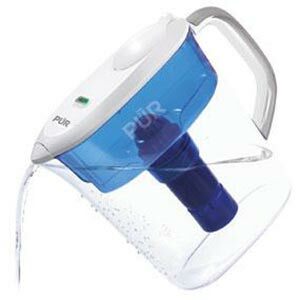 A very popular type is the pitcher-style water filter. Here, I’m including all types of gravity-fed style countertop filters, like the Big Berkey (shown above), or the Zen (shown below). These are appliance-sized filter housings that rest on your countertop. You use a decanter to fill a reservoir in the top. The water then flows down through the filter material into a second reservoir, or into the same decanter you place underneath it. The great thing about Pitcher filters is that they’re simple to use and easy to maintain. It’s very easy to reach and change out the filter or filters. The downside to these is that they take up precious counter space. Different models and brands have varying capabilities. Typically, the models that are more capable of filtering out contaminants better, will generally cost more than the cheaper ones, but as you’ll see, this is not always the case. Filter changes and cleaning is fairly easy. Large models are very capable of filtering out contaminants and have a good filter life. Takes up limited counter space. Less capable and shorter filter life than under counter water filters. Some countertop filter appliances have low dispensing spout, which forces you to slide the appliance to the edge of the counter so that you may get your glass or pot underneath it. You either have to live with it in this location, or always be sliding the appliance back out of the way, then forward to the edge when you want to dispense filtered water. You frequently must refill the reservoir with water. The filtering process is usually slow and you’ll and sometimes you’ll have to wait until the water has been filtered in order to draw from it. Large models take up lots of counter space. Very large models may not fit under wall cabinets. Generally, gravity-fed, pitcher-style countertop filters are slow to filter. 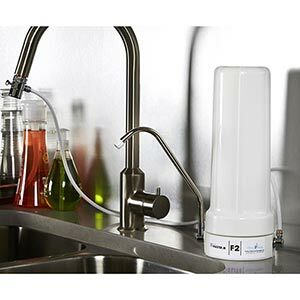 This type of water filter is enclosed in a filter housing and is intended to sit on top of your counter at or near your kitchen sink. This type connects to your sinks faucet spout, in place of the aerator. It’s operated by your household water pressure. This style of filter has its own dispenser spout. 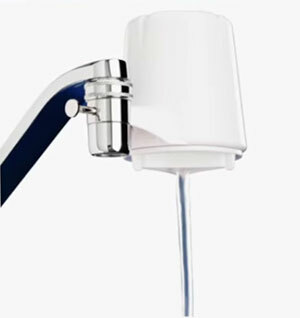 With faucet-connected water filters, you must turn on the cold water valve to a slow or moderate flow. You can then divert the normal flow of water from the sink to your water filter with the easy flip of a push-pull button or a lever. Depending on whether you’re filling a glass of water to drink, or you’re filling a pot for cooking, you may have to reposition the filter body to reach it. Depending on the model, these filters can be single stage, or have multiple stages of filtration built into single filter cartridge. Generally easier to use than pitcher water filters. Set-up is fast and filters are very easy to access for replacing. There is no reservoir to have to refill. You don’t have to wait for your water to filter. There is no waste of water as with some under counter filters. Larger models offer better filtering ability. These filters use up limited counter space. They can seem to be in the way. they don’t connect to all faucets. They generally have shorter filter life than under counter water filters. To assure more complete filtering, you must keep the flow relatively slow. Virtually every one I’ve researched has a high percentage of very unsatisfied customers. This style of water filter mounts directly onto your kitchen faucet spout. These are really easy to install and offer an inexpensive way to make your water healthy for drinking. Due to their ease of use, your family may be more apt to use a water faucet filter. Think about what would happen if you purchased a pitcher-style filter. If it runs out of filtered water, will every member of your family take it upon themselves to replenish the pitcher reservoir, or will it likely be left for you to have to refill every time? These filter cartridges need to be smaller than the models that rest on the counter. Because of this, the life of the filter are much shorter than models with physically larger filters and they don’t filter as well. Set up is fast and filters are very easy to access for replacing. You don’t have to keep refilling a reservoir with water and there is no waiting. Produces no waste water as happens with most Reverse Osmosis systems. These filters add bulk to your faucet and can seem clunky and in the way at times, say when your washing the dishes or something. They generally have much shorter filter life than with larger water filters and RO systems. It’s not as easy to tell when you need to change the filter. A residential Reverse Osmosis system is your most effective way to remove the widest range of contaminants from your drinking water. What makes these the best under counter water filters?